When you wake every morning, it’s a soulful feeling to watch your garden grow, and smell the sweetness in the air. A hot cup of coffee to wake your senses, a walk in the yard, fresh air to uplift your spirits – it just seems like the perfect way to kick-start your day. After the harsh winter and what seems like eons of staying sheltered indoors, spring gets us to bolt out that door and soak up the sun. It’s a great feeling to watch stark naked trees start showing signs of life again – leaves and flowers start blooming and the cycle of seasons begins all over again. It’s time to breathe new life into your yard with the most amazing selection of springtime flowering plants. It’s time to step into the vast outdoors and prep your yard for the best gardening plants this spring. Get geared to transform your garden from ordinary to extraordinary with some of the most vibrant spring flowers you can think of. Allow us to help you pick the right selection of spring flowers to complement your yard and become the envy of the neighborhood. Pansies are annual flowers, and they look absolutely gorgeous in window boxes and early-season containers. For the record, the botanical name is Viola x wittrockiana. Keep in mind that Pansies don’t have an extended shelf life when bought in packs. If you’re heading to the nearest garden center, remember, you’ll probably end up buying an old, withering one at a discount. Good-quality pansies are compact, show minimal signs of yellowing, and don’t have too many blooms while they are still in packs. Sure, they might lack color when you purchase them, but these are the plants you definitely want for your garden. Another way to make sure they are healthy is to pop a few out and look at the roots; if they are white in color, it’s all good. You won’t have too much trouble growing pansies. All they need is good soil, a steady source of moisture, and partial sunlight. However, they are intolerant to heat and humidity, and that’s why they grow to their optimum best in spring. Pansies need a gap of 6-8 inches between them. You could plant them as borders or in large masses. However, resist growing them as solid ground cover. These plants respond well to periodic deadheading. Whenever possible, every few days, just pinch off the faded blooms and the fruit which are the small, green seed capsules that might sprout. This accelerates the blooming process. 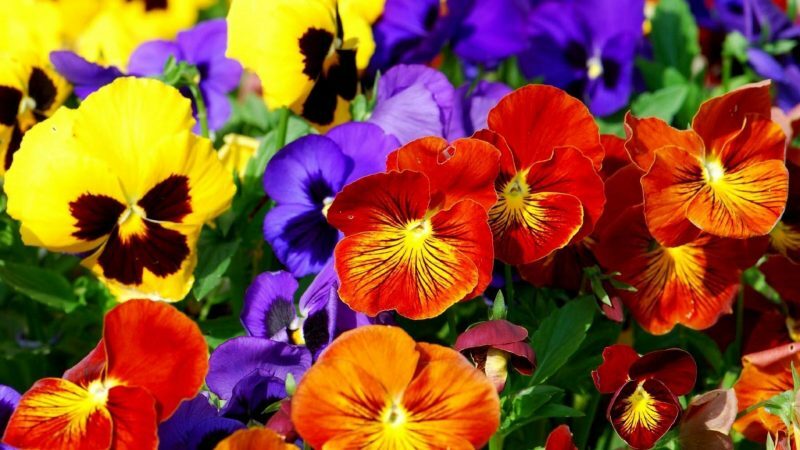 Pansies are known to grow to about 10 inches tall and 12 inches in width. They respond well in zones 4-8. 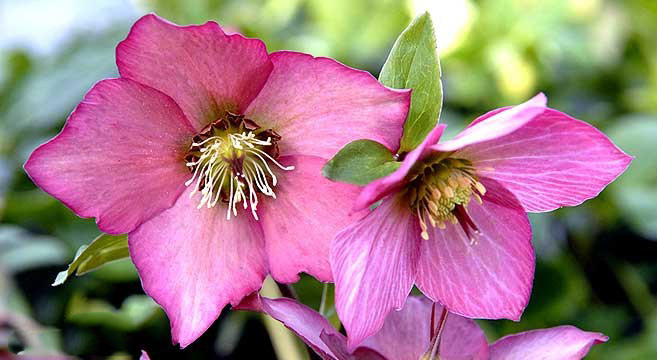 You might be more familiar with this species as Lenten rose, or more popularly, Christmas rose. The scientific name would be Helleborus niger. You do have a choice of colors ranging from black-purple, red-purple, white, pink, right up to a vibrant yellow. Hellebores are tagged as fragrant and long-lasting. It’s not just the stunning flowers that exude beauty; their alluring green foliage is also known to aesthetically complement your landscape to a whole new level. These evergreen perennials require minimal care, and they are not a favorite with deer and other critters and pests akin to feeding on them. It’s imperative that you understand Hellebores are extremely poisonous, so make sure you keep a safe distance. Plant your Hellebores in well-draining, organic soil in a shady area, or an area devoid of direct sunlight. It’s a good idea to plant them under deciduous trees, or even scatter them through a wooded garden. You also need to keep a close watch with fertilization – go easy on the nitrogen or you’ll just land up with lush foliage and not enough blooms. Hellebore can grow up to 12 inches tall and 18 inches wide, and they grow just fine in zones 4-8. Bloodroot, scientifically called Sanguinaria canadensis L., belongs to the Poppy family and is a herbaceous perennial that lasts for a relatively short period. This white, fragile springtime wonder blooms from the center of its curled leaf, opens in the sun, and closes at nighttime. Nonetheless, it’s more than just a plant; Indians used the red juice from its underground stem as a dye to decorate clothing, baskets, war paint; it also doubled up as an effective insect repellent. The soil needs to be moist and wet, well-drained, and rich in humus. The ideal way for propagation is by seeds. Make sure to plant them ASAP before they dry out. Bloodroots spread rapidly and make excellent ground cover. They work out really well as groundcover around trees. The roots are poisonous and could be fatal if ingested. Make sure you have your gloves on, and wash your hands thoroughly after handling the roots. These plants can grow up to 6 inches tall and 12 inches wide. They grow fantastic in zones 3-9. Yellow Trillium, also known as Trillium luteum, belongs to the Liliaceae or lily family, and is classified as herbaceous perennials. They are rhizomatous herbs with unbranched stems, and unlike other plants, they don’t have true leaves or stems above ground. The leaf-like structures are called “bracts” and function just like leaves. These bright yellow flowers are known to exude a very fresh, lemony fragrance. 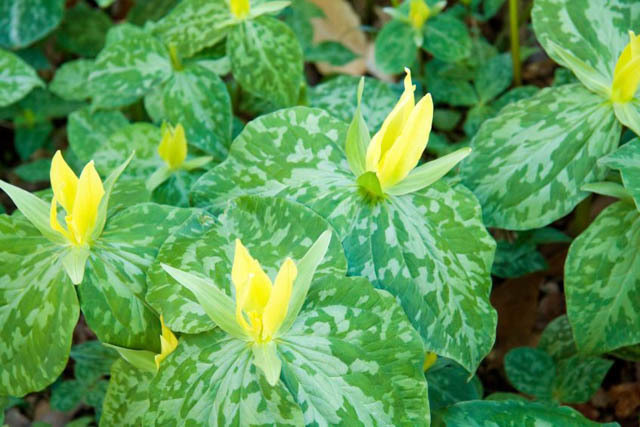 Yellow Trillium is commonly found in North Carolina, Georgia, Tennessee, and Kentucky. They usually flower in April-May. You can grow these quaint plants in well-drained soil rich in humus with medium moisture content. Grow them in part shade and to full shade, and water them at regular intervals. Just keep in mind this species doesn’t transplant well and shouldn’t be dug in the wild. They work excellent when massed in a well-shaded woody or wildflower garden, but it’s not recommended to plant them as perennial borders. Yellow Trillium grow 16 inches tall and 12 inches in width. They are great for zones 5-8. Also scientifically called Anemone sylvestris, this spring flower is probably more popularly known as Snowdrop Windflower. They are native to Europe and Asia, and are known to grow beautifully in parks, yards, or just about any sort of culturally-influenced land. You can use these perennial herbs to naturalize woodland areas, or as decorative plants to enhance your landscape. Snowdrop Anemones when in bloom are white in color with yellow stamens, and are mildly fragrant. These species can be easily grown in average to medium moisture, well-drained soil in part shade or full shade. If you plant them in loose soil, they can be aggressive and spread less in clay-rich soil. 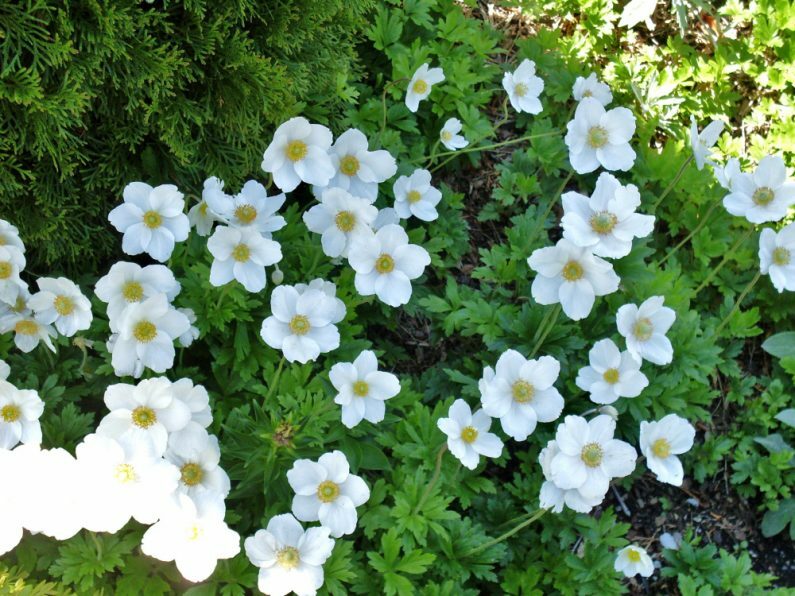 However, Snowdrop Anemones prefer sandy, humus-rich, and moist soil conditions, and grow to their optimum best in April. They are known to grow up to 6 inches tall and 12 inches wide. Snowdrop Anemones are akin to growing in zones 4-8. These pink, butterfly attracting trees are ideal to bring a pop of color and texture to your yard. Redbuds are native to North and Central America and fall in the category of deciduous trees. They are noted for their rose-purple flowers growing on bare branches during March-April. You’re likely to bump into Redbuds along rocky streams, open woodlands and woodland margins, limestone glades, and thickets. These bright flowers bloom in clusters of 4-10, followed by leguminous bean-like dry seedpods that turn brown when mature. 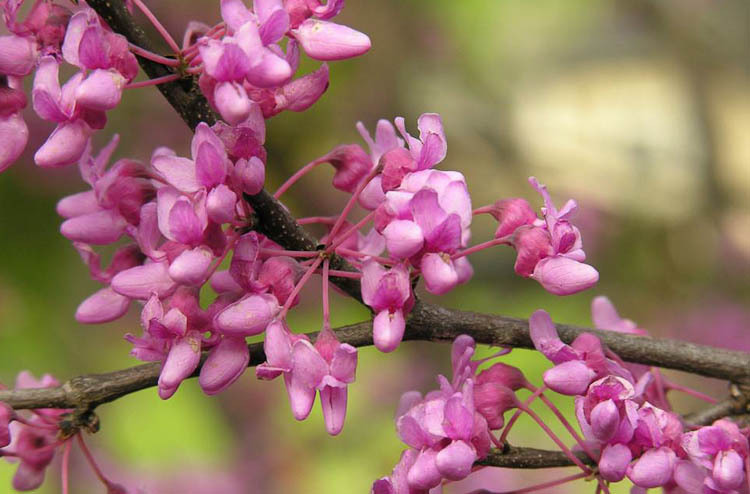 Redbuds grow well in well-drained soil with average to medium moisture. Plant them in full sun or part shady areas (part shade is recommended during hot, summer months). They grow to their full potential in moderately fertile soil with consistent moisture source. Redbuds don’t transplant well, so it’s a good idea to plant them young and leave them undisturbed. They look great as patio and borders, and work well in naturalized settings too. Redbuds are known to grow up to 30 feet tall and 30 feet wide. You’ll find them mostly in zones 5-9. These deciduous plants are available as dwarf shrubs to taller trees, and an absolute go-to springtime favorite! Also scientifically known as Syringa vulgaris, Lilacs bloom on old wood. They have a soulful purple color with white-edged petals, and are great at attracting hummingbirds and butterflies. Lilacs belong to the olive family and bloom in April-May, and are grown for their fragrance. They are native to the scrubs in southeastern Europe, open woodlands, and rocky hills, but are known to be widely cultivated throughout Europe and North America. Lilacs are primarily purple, but you might get lucky with shades of white, cream, rose, magenta, pinkish-purple, or lavender. 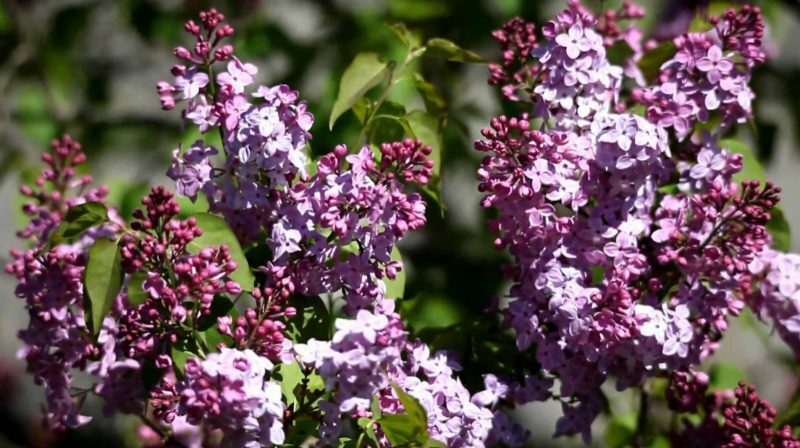 Though Lilac is not native to the U.S., it’s the State Flower of New Hampshire. Lilacs grow extremely well in well-drained soil, average to medium moisture conditions, in full sun. Though they can tolerate light shade, they bloom best in direct sunlight, and are intolerant to full shade. Lilacs prefer moist, fertile, and slightly acidic to alkaline soils with good drainage; keep them away from soggy soil. Make sure you prune your Lilacs immediately after flowering. Remove the root suckers to prevent unwanted colonial spread while also maintaining its appearance. You can propagate Lilacs efficiently by cuttings in spring. Lilacs are known to grow 20 feet tall and 20 feet wide, and are common to zones 4-8. This early spring-blooming bulbous perennial scientifically called Muscari armeniacum, is native to southeastern Europe and Armenia. Grape Hyacinth has tightly packed, violet-blue, grape-like flowers with each flower having a thin white line around the rim. The showy, fragrant flowers bloom during early spring in April, and they are one of the most beautiful flowers you can grow to upscale your yard to a whole new dimension. These plants are usually dormant from late spring to autumn. What’s more? If you live in a deer infested region, you’ll be happy to know that these flowers are deer tolerant. 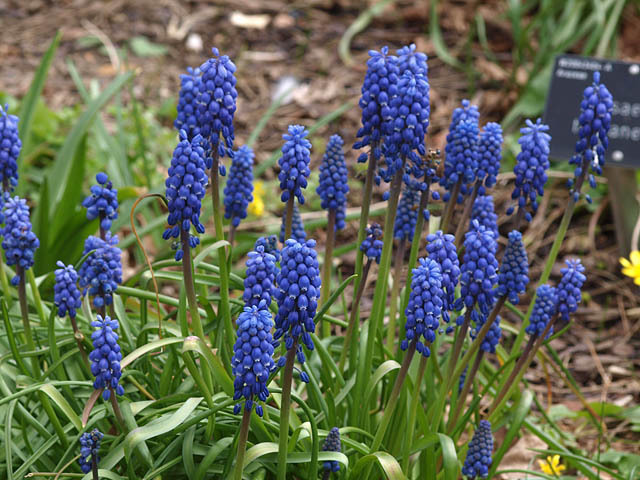 Grape Hyacinths blossom easily in medium to average moisture, well-drained soil in full sun to part shade. Make sure you keep the soil moist during spring, but cut down on watering after foliage begins to die. 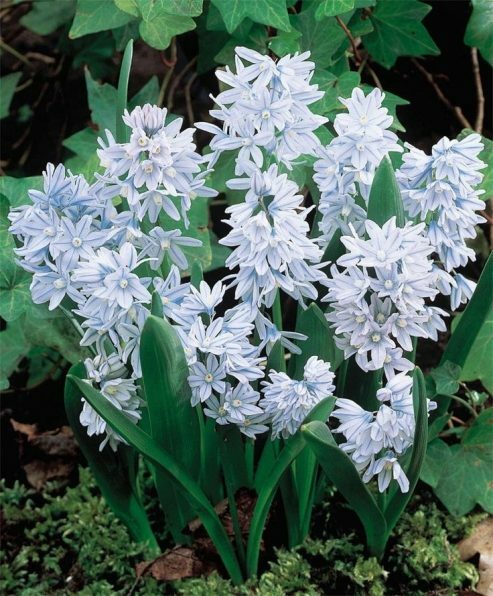 You can naturalize these Hyacinths through bulb offsets, but not too aggressively. 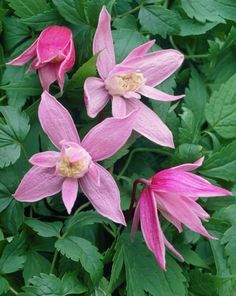 Grow these flowers under deciduous trees, as masses in open areas, around shrubs, rock gardens, or as borders. Grape Hyacinths are also popular container plants. Grape Hyacinths grow to about 8 inches tall and 6 inches wide. You’ll find them aplenty in zones 4-8. Your garden is incomplete without the absolutely gorgeous daffodils. They are bright, cheerful, and just seem the best way to welcome spring. Daffodils come in many colors – white, yellow, orange, pink, bi-color – and different shapes, and sizes too. Deer and rabbits don’t seem to take to these flowers too well, so your daffodil garden is safe from being devoured. Daffodils aren’t going to eat into your time because they are extremely low-maintenance. March to April is when you’ll find them in full bloom. These bulbous perennials appear in single or clusters, and look like trumpets or cups. Daffodils demand well-drained sandy, loamy soil that’s organically rich, mildly acidic, and has medium moisture. They need full sun to part shady conditions; proper soil drainage is essential. Make sure you plant the bulbs 2-4 times its height in early to mid-fall. Once the flowers are in full bloom, remove the top portion of each flower stem to prevent seed formation. However, don’t cut away the foliage until it turns yellow. Taller varieties work well in beds, wild gardens, borders, in front of shrubs, massed under trees, or in open woodlands. Smaller varieties are great as indoor blooms in winter. 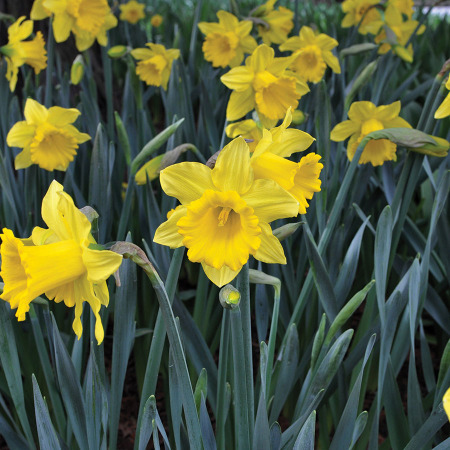 Daffodils grow to about 1 foot tall and 1 foot wide, and are known to grow beautifully in zones 3-9. The ideal and most preferred springtime flowers are available in just about any color you want in your garden, except true blue. Tulips look like a cup or teardrop with six petal-like tepals. Though they bloom April-May, bloom time depends on the exact variety of Tulips you plant (there are about 15 divisions of Tulips). 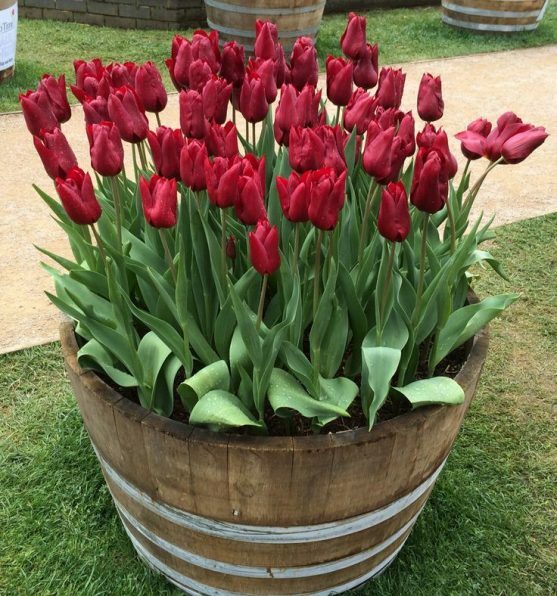 Tulips flourish in fertile, medium-moisture, fertile, well-drained soil in full sun. They prefer moist, cool winters, and warm, dry summers. You can grow Tulips as perennials or annuals; species tulips usually work better as perennials than most hybrid varieties. When growing them as perennials, make sure you snip off the spent flower stems after they bloom to prevent seeding, but don’t remove the foliage until it turns yellow. Tulip bulb and roots are prone to rot, and tend to get infested with gray mold and mosaic virus in poorly drained soil conditions. Critters and creepy crawlies are likely to play havoc, so make sure you keep a close watch. Tulips look great when massed and planted in large groups. Tulips grow to about 2 feet tall and 1 foot wide. They grow healthy and pretty in zones 3-7. Also called the striped squill, Puschkinias belong to the Asparagaceae family. These bulb-like flowers are bloom in March-April to a beautiful blue color. Most flower petals have a blue center stripe, though some are just completely white. Flowers are fragrant and showy and tolerant to deer, so you don’t have much to worry about them being wasted away. Of course, they are low-maintenance, so you don’t have to watch them like a hawk. Plant your Puschkinias 2-3 inches deep and 3 inches apart. They grow hassle-free in medium moisture, well-drained gritty or sandy soil in full sun to part shade. The plant naturalize via self-seeding and offsetting bulbs. Make sure you don’t remove the foliage after they bloom until they turn yellow in color. You could grow Puschkinia in open woodlands and meadows, rock gardens, under deciduous trees, in front of shrubs, or along walkways. Getting creative and mixing them with other springtime flowering bulbs is a great idea. Puschkinia grow 8 inches tall and 6 inches wide, and are known to catch on well in zones 3-9. These herbaceous perennials belong to the Apocynaceae family, and are popularly called Ozark Bluestar or Shining Bluestar. 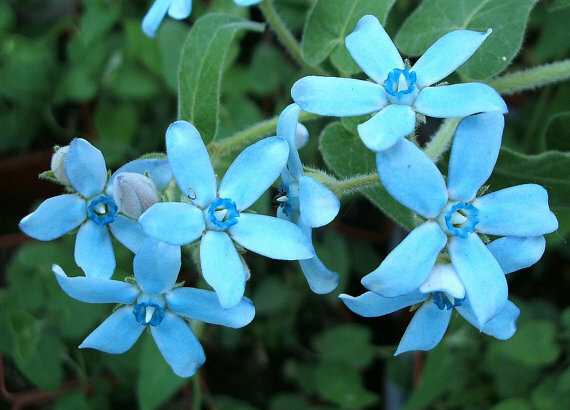 They are light blue in color when in bloom, and are fantastic butterfly-attracting flowers. Bluestars bloom in May, and aren’t palatable to deer, which is definitely a blessing in disguise. Scientifically called Amsonia illustris, this plant is native to Missouri. They can be sighted in rocky or sandy soils on gravel bars, and even along streams. Bluestar prefers loamy, moist soil, and can tolerate drought-like soil to some extent. They are known to grow best in medium to average, well-drained soil in full sun to part shade. When grown in ideal conditions, Bluestar requires no pruning or staking. That being said, these plants can turn floppy and more open if you were to grow them in the shade and rich soil; these might need to be pruned or staked. Bluestars grow well in naturalized areas. You can use them as borders, in meadows, open shade gardens, and native plant gardens. These blue blossoms grow to about 3 feet tall and 4 feet wide, and are common to zones 5-9. These angelic white flowers are native to Western Asia and Europe. 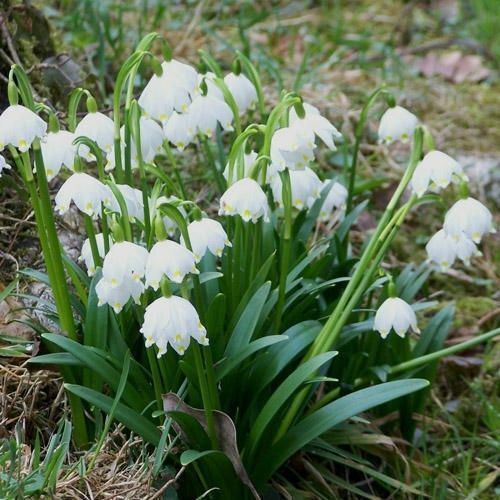 Scientifically called Leucojum aestivum, it blooms weeks after spring snowflake and usually turns dormant by summer. In bloom, you’ll find about 2-5 white, droopy, bell-shaped flowers atop hollow flower scapes. Each flower has three similar looking sepals and petals with spotted green tips. Summer Snowflake needs a consistent share of moisture during its springtime growth and blooming phase. They adapt well to clay soils, but are easily grown in organically rich, well-drained, medium moisture soil conditions. You can plant them in full sun or part shade. In summer, they are known to tolerate dry soil, though it’s a good idea to mulch the area to keep the soil moist and cool. Make sure you plant bulbs 3-4 inches deep and 4-6 inches apart. You don’t need to busy yourself with the bulbs; they are best left undisturbed once planted. Naturalization happens best with bulb offsets, borders, rock gardens. You can grow them under trees and shrubs. They work really well as stream and pond margins. A desirable way to plant them is in groups of 15 bulbs or more. Summer Snowflakes grow to about 3 feet tall and 1 foot wide, and are common to zones 4-9. 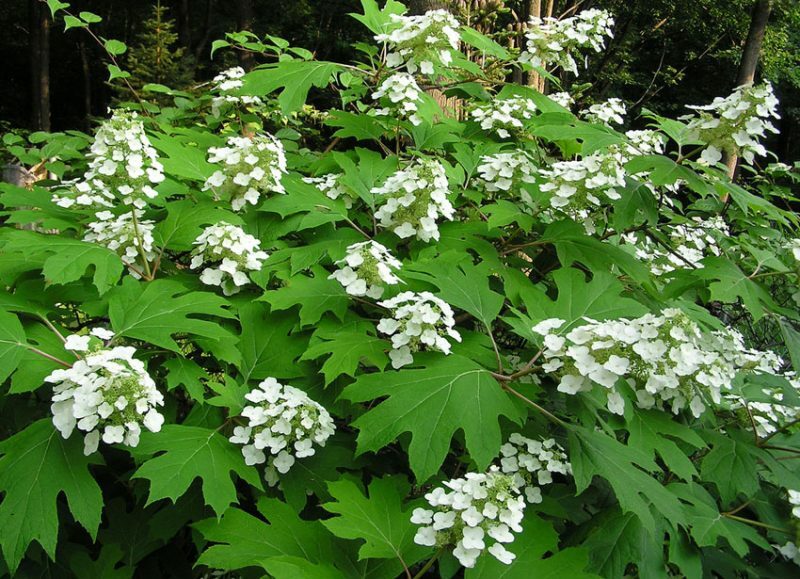 Native to Southeastern United States, the Oakleaf Hydrangea is a deciduous shrub that belongs to the Hydrangeaceae family. During bloom in May-July the flowers change from white to purplish-pink. They are scientifically called Hydrangea quercifolia, and are multi-stemmed, deciduous shrubs. Oakleaf Hydrangea is commonly found in bluffs, ravines, moist wooded regions, near streams right from Georgia and Florida to Louisiana. It gets the name “Oakleaf” from its oak-like dark green leaves. These plants thrive in well-drained, organically rich, medium moisture soil conditions in full sun to part shade. Moist soil and summer mulch helps keep Oakleaf Hydrangea supple and moist during the warm summer months. If pruning is needed at all, make sure you do it immediately after flowering. They are low-maintenance, but can be prone to leaf blight and mildew. Critters like, aphids, and spider mites might also visit occasionally. Oakleaf Hydrangeas work great as accents for foundations or areas near patios and homes. They are amazing informal hedges. You can grow them in masses or groups as shrub borders; they grow just fine in open woodland areas too. These upright, broad-rounded gorgeous flowers grow up to 6 feet tall and 8 feet wide. They are common in zones 5-9. These modest, showy flowers are deep violet-purple color when in full bloom in March and are early spring bloomers. Colors range from a white, lavender, purple, and yellow; they are goblet-shaped flowers and white in the middle. Crocuses close at nighttime and open in the morning; they usually remain closed on overcast and rainy days, and are native to meadows and woodland regions. 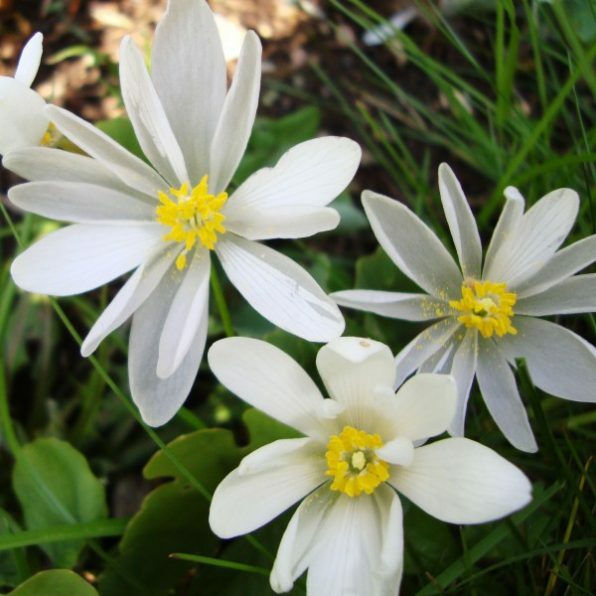 Snow Crocus is known to thrive in gritty, sandy soils, and grow easily in well-drained, average to medium moisture conditions. Plant them in full sun or part shade, and incorporate sand if necessary for improved soil drainage. 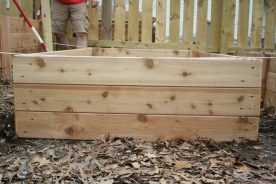 Plant them about 3-4 inches deep and 3-4 inches apart. Don’t remove the foliage until it turns yellow. You can naturalize Snow Crocus with offsets and self-seeding. Mass them in lawns, sunny woodland regions, under trees, and they are a treat to watch. They could be grouped in rock gardens, as shrub fronts, along walkways, or just around the house. Crocus grows to about 2-6 inches tall and 3-6 inches wide, and is found in zones 3-7. These spectacular bright yellow shrubs just scream “springtime” louder than most others. You can’t miss these deciduous shrubs that bloom in March-April. They are ideal harbingers of the season, and look great when planted as hedges. There are several hybrid varieties available, and you can choose the kind that best complements your landscape. Forsythia grows best in full sun to part shade, though they flower best in sunny conditions. They can tolerate average to poor garden soils, and withstand moderate drought-like soil once established. These plants usually spread by rooted stem cuttings. You can grow them as borders, foundations, mass them on slopes and banks, and open woodland gardens. 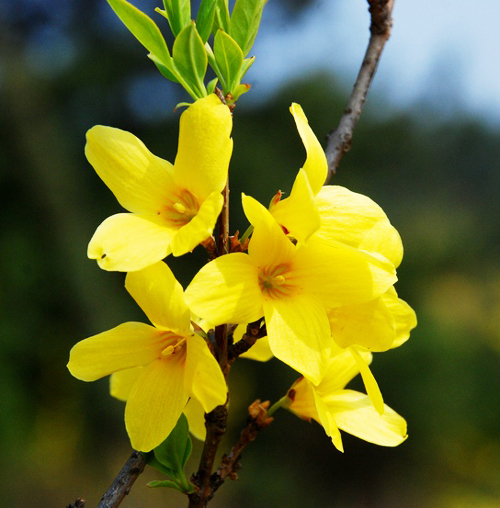 Forsythia grows to about 1-2 feet tall and 1-4 feet wide. They grow substantially well in zones 5-8. This herbaceous white perennial belongs to the Asparagaceae family and blooms in April. These sweetly fragrant, bell-shaped flowers plants are ideal for ground cover. Though native to Europe, they are a favorite garden wildflower in the U.S.
All parts of the plant are poisonous because of their cardiac glycosides content. Make sure you wear gloves while handling these plants, and be sure to wash your hands well after tending to them. 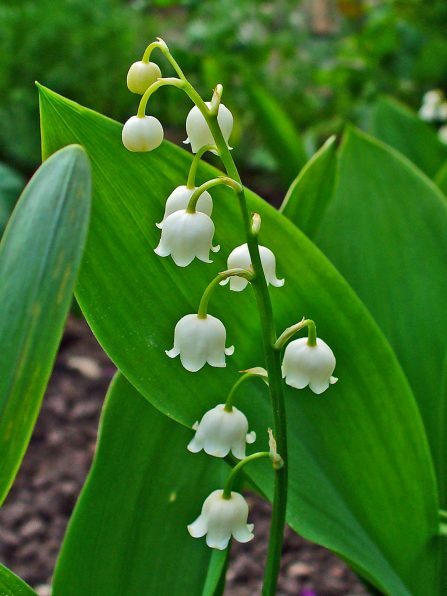 Scientifically called Convallaria majalis, Lily-of-the-Valley grows easily in moist, fertile, well-drained, organically rich soil in full or part shade. When conditions are just about right, these rhizomes can spread rapidly to form dense colonies. They can be left undisturbed for years, and naturalize well in woodland areas. The plant is known to grow well in cool weather conditions, and can’t tolerate hot and humid summer climates. You can propagate them via root division in spring or fall for the best results. They work great as cut flowers, and perform well under the shade of shrubs and trees. Lily-of-the-Valley grows to about 8 inches tall and 8 inches wide. They grow to their optimum best in zones 3-8.
Who would have thought that Chives would turn out to be the ideal springtime delight! Well, they aren’t just limited to adding flavor to your cuisine; they work just as great in your garden. What’s more? 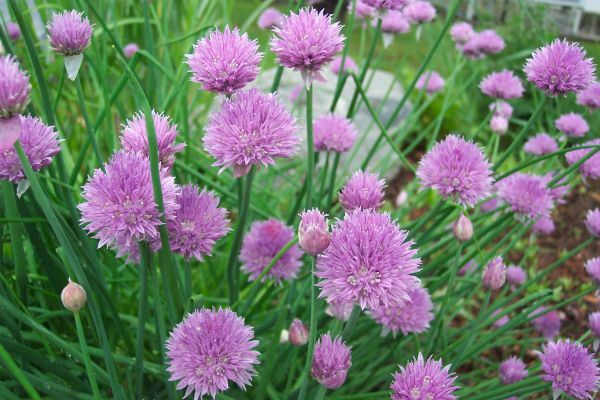 Chives are haven to butterflies and bees, so you have more than one reason to plant this herb in your spring garden. Also, they are a put-off for deer, so your garden is safe from being chomped away. Chives, scientifically called Allium schoenoprasum, turn a bright purple when they bloom in April-May, and need minimal looking after. They work great as ornamental flowers, and you can use the flower heads as garnish in soups and salads. Chives grow fantastic in well-drained, average to medium soil in full sun or part shade. They are easily propagated from seeds, and will self-seed if withered flower heads are not deadheaded. You can mass or group Chives as edgers in your herb and vegetable gardens. They also look amazingly gorgeous as border fronts and in rock gardens. Chives can also be grown as potted plants on a cool kitchen window sill for continued harvesting. Chives are known to grow about 1-2 feet tall and wide, and grow great in zones 4-8. These herbaceous perennials have three purple falls with brown veins, yellow beards, white bases, and three standards are Lilac. They are also called Flags, and sometimes, German Iris; scientifically, they are called Iris germanica. You’ll find them in a wide variety of colors (except red) and sizes to match your preference. 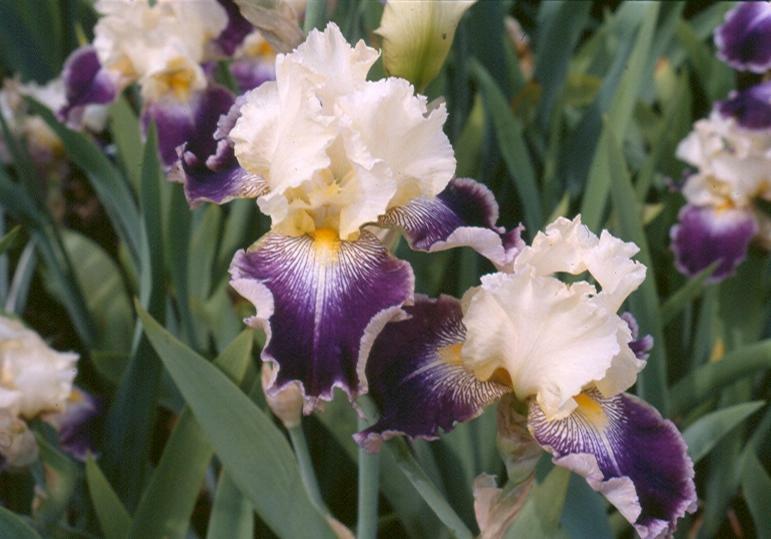 Bearded Iris grows healthy in humus-rich, well-drained soil with medium moisture. They need the full sun and can tolerate light shade. 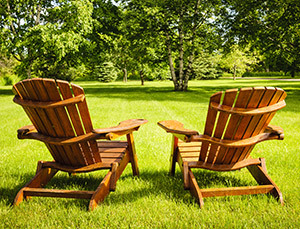 Make sure you don’t mulch the area, because moisture can lead to soft rot issues. Don’t resort to overhead watering. Make sure you divide plants immediately after flowering around the time when overcrowding occurs, which is every 3-4 years. These plants tend to naturalize into large clumps. They are well-suited as sunny borders and beds. Bearded Iris grows to about 2-3 feet tall and 1-2 feet wide. They are found in zones 3-10. They are deciduous shrubs native to southern and central Korea. 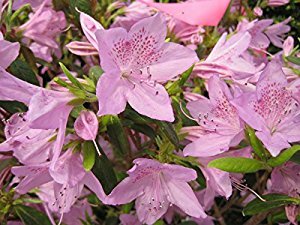 Azaleas are pinkish-purple in color when they bloom in April-May, and belong to the Ericaceae family. If you’re looking to turn your garden into a butterfly friendly zone, Korean Azalea can work wonders! The cherry on top is that they attract humming birds too. There are several hybrid varieties available; so you have a great palette of shapes, shades, and sizes to choose from. Azaleas take extremely well to humus-rich, acidic, moisture-retaining yet well-drained soil. You can choose to grow them in part to full shade regions. Be careful to plant them away from strong winter winds. Poor draining soils can cause roots to rot, and plant Azaleas at a safe distance from shrubs. A shallow root system demands a good source of organic mulch to retain moisture, soil temperature, and protecting roots from drying out. These plants are prone to critters, so you need to keep a close watch on your Azaleas and take good care of them. You can grow Azaleas in groups or masses, borders, woodland areas; they work just as well as a foundation planting. Korean Azaleas grow to about 3-6 feet tall and 6-12 feet wide. They are ideal for growing in zones 4-9. These herbaceous perennials go from pink to blue when they are in full bloom in April-May. Scientifically called Pulmonaria saccharata, Bethlehem sage is favored for its foliage than its flowers. The flower clusters are two-toned because they turn from pink to blue when mature. 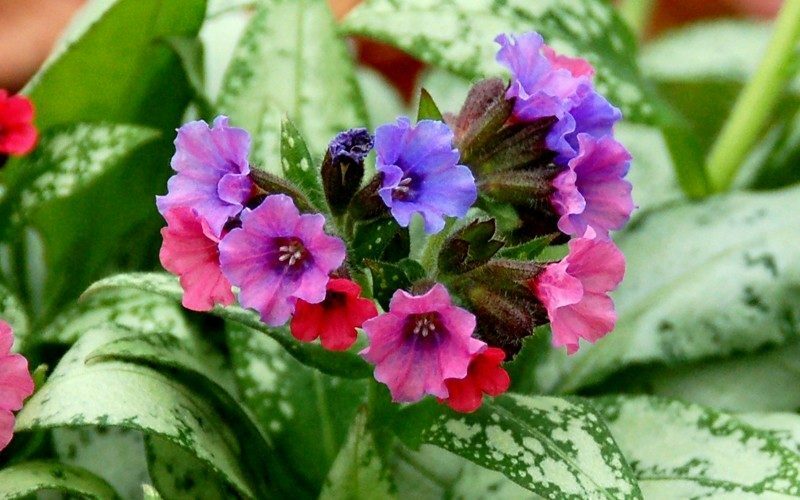 They are sometimes called “Lungwort,” and are native from France to Italy. These plants work best in consistently moist, humus-rich, cool, and well-drained soil. Grow them in full sun to part shade and they grow healthy and robust; don’t let the soil dry out. Resist the urge to plant them in full sun where leaves tend to wilt or get scorched. They aren’t invasive, but spread gradually via creeping roots. Powdery mildew and slugs are occasional problems, but otherwise they are insect- and disease-resistant. They are best grown in groups or massed as ground cover in shady areas. They work just great as border plants as well. Bethlehem sage grows to about 18 inches tall to 24 inches wide, and is best suitable in zones 3-8. These yellow herbaceous perennials belong to the Berberidaceae family, and are extremely tolerant to rabbits, deer, and drought conditions as well to some extent. Colorful leaves emerge with a reddish tinge in spring that soon turn green when mature, and transform to red in fall. 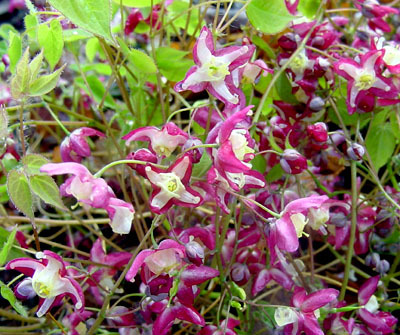 Scientifically called Epimedium × versicolor, they are low-maintenance, which is means you don’t have to dote on them hand and foot. They are also popularly called Barrenwort, Fairy Wings, or Horny Goat Weed. Bishop’s Hat prefers loose, rich, loamy, average to medium, well-drained soil in part to full shade. They can also resist drought-like conditions once established. These rhizomes catch on faster than most other epimediums. They produce abundant seeds which should be ideally started indoors. They work spectacularly well as spring groundcover, but are ideal on hill slopes protected by trees, or rock regions where sunlight is brightest in the morning. You can use them as border fronts or edgers for walkways. Bishop’s Hat grows to about 9-12 inches tall and 9-18 inches wide, and grows well in zones 5-9. These vines belong to the Ranunculaceae family, and are native to Siberia, Mongolia, and China. When they bloom in April, the flowers are lavender-blue to purple in color. They are deciduous, early-blooming, part-woody climbing vines with lantern-shaped flowers. The flowers give way to pinkish seed heads which are mostly used for ornamental purposes. These plants grow well in medium moisture, well-drained, fertile soil in full sun to part shade. You need to keep the roots evenly moist in a cool, shaded area. Though pruning is not necessary, you might want to shape them immediately after flowering. Downy Clematis work well as climbers on walls, fences, trellis, porches, lamp posts, and just about any other nook or crannies that comes to mind. Since they flower early, gardeners plant them to sprawl through shrubs. Clematis is known to grow 8-12 feet tall and 3-6 feet wide, and grows best in zones 3-8. These small deciduous trees give rise to star-shaped, fragrant, white flowers in early spring in March-April before the foliage. Once the flowers bloom, cone-shaped fruits ripen in late summer, which then release red-coated seeds at maturity. If you aren’t quite satisfied with white Magnolias, there are a lot more available in blush-pink, lilac pink, or pink – take your pick. Magnolias grow best in well-drained, moist, loamy, organically rich soil in full sun to part shade. They are resistant to extreme dry or wet soil conditions. Sometime, they could take 3-4 years for the first blooms to appear. Since early springtime frost can damage the flowers, Magnolias are best-suited in a protected location. 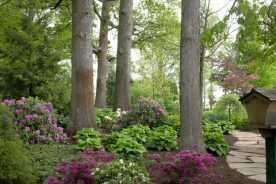 These trees are great for your lawn or shrub border. You could also grow them as a border in a woodland area. 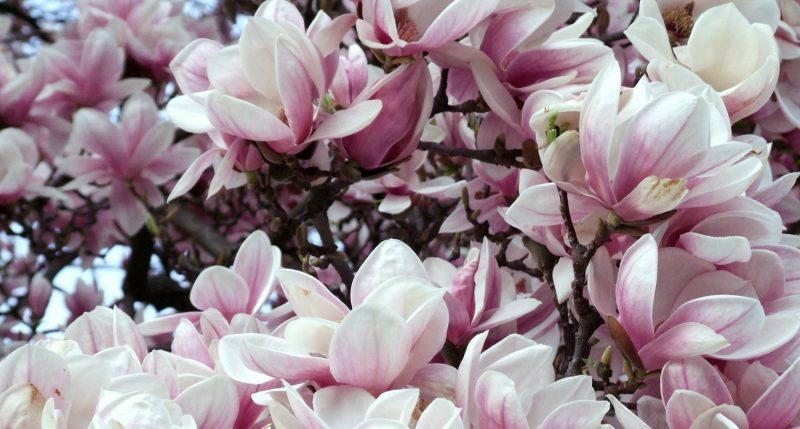 Magnolias grow 30 feet tall and 30 feet wide, and are ideal for zones 5-9. Scientifically called Euphorbia polychroma, these herbaceous perennials belong to the Euphorbiaceae family, and are native to central and southeastern Europe, and Asia Minor. Cushion Spurge bloom as yellow bracts in April-May. Though the flowers don’t stand out, the bracts are exceptionally showy, and the leaves turn red during fall. These plants are resistant to deer and rabbits, so you don’t have to worry about them being eaten away by nosey critters. Spurges need well-drained, dry soil and full sun. They could do with some light to medium afternoon shade during the hot summer months. However, you need to be careful because the clumps tend to lose their shape in excessive shade. They are tolerant to poor soils, which includes rocky and sandy soil. Make sure you remove withered and spent flowers to prevent unwanted self-seeding. Grow them as borders in your garden to make best use of these plants. 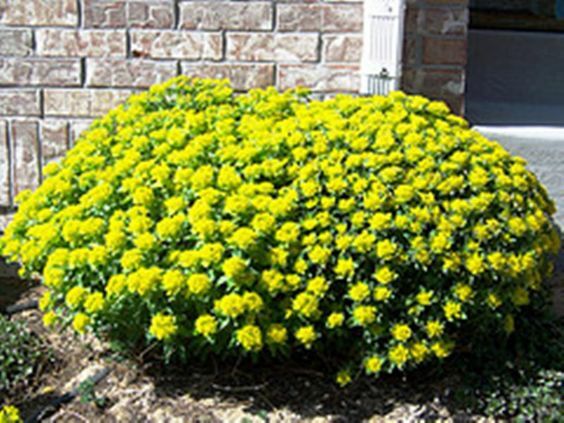 Cushion Spurge grow 18 inches tall and 18 inches wide, and is ideal for zones 4-8. These blue, lavender, or white flowers are herbaceous perennials which belong to the Ranunculaceae family. Hepatica bloom in March-April, and is a Missouri native spring wildflower that usually grow in rocky, wooded slopes, ravines, and moss-laden banks. Unlike few others, these flowers don’t have stems with large basal leaves and anemone-like flowers. Hepaticas relish medium moisture, well-drained, humus-rich soils that prefer part shade. Make sure the soil stays moist and doesn’t dry out. They are self-seeding plants when the temperatures and soil conditions are just right. 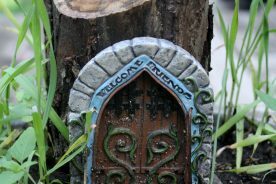 As far as critters go, there are no serious insect or diseases affecting Hepaticas. They are ideal for shaded areas in rock gardens, and are best naturalized in large sweeps of woodland and native plant gardens. 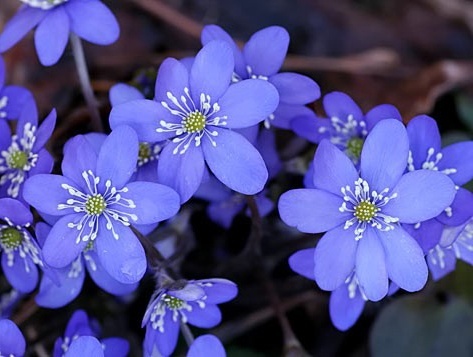 Hepatica grows 16-18 inches tall and 16-18 inches wide, and is ideal for zones 3-8. Make sure you choose the best bulbs at the garden center rather than just short-listing them based on prices. You need plump and firm bulbs, and not soft and mushy ones, or those that have mold on them. Bog bulbs are good; they bloom better compared to their smaller alternatives of the same variety. Unless you plant the bulbs in the right spot, your effort is likely to be wasted. Most bulbs need direct sunlight for at least 6 hours, and well-drained soil conditions. You need to make sure you plant your spring-bloomers in September or October when the soil is cool. One way to do this right is to dig a hole 2-3 times deeper than the bulb’s height. For example: If the bulb is 3 inches tall, the hole needs to be at least 6-8 inches deep. Bulbs grow fabulous in well-drained soil that’s organically rich. Mix compost in the planting holes to make sure your bulbs bloom healthy. This becomes imperative if the soil is clay-heavy or moist. Make sure the soil is free of weeds because they steal soil nutrients and tend to invite insects and diseases. An easy way to do this is to spread 2-3 inches of mulch on the soil. Water is essential to help roots catch on healthy and quickly. Watering your plants regularly eliminates air pockets in the soil which is a primary reason for the bulbs drying out. North America is divided into 11 planting zones in the USDA Hardiness Zone Map where each zone is 10 °F colder or warmer during an average winter than its adjacent zone. This map is every gardener’s go-to place in the United States, and you’re bound to bump into them most magazines or catalogs; nurseries also use the USDA Map extensively. Climate hardiness zones came into the picture to help gardeners find a way to compare climatic conditions ideal to grow plants in a given season. If you need your plant to survive and grow healthy, it should be able to tolerate the climate in your area of residence – highest and lowest temperatures, rainfall, and much more. Spring brings with it an adrenaline rush and makes you scoot out that door and soak in the fresh, cool air and bathe in the sun. It’s also the time when spring blossoms bask in all their glory in bright, bold, and amazing hues of the rainbow. You can make that bare-looking window interesting and spectacular just by placing a vase of pretty daffodils to give it texture and a dash of spring color. They can add oodles of cheer to an extremely busy area in the house, like the kitchen. Daffodils are cost-effective, so you wouldn’t have trouble finding one that’s fits your budget. Pansies can also do the trick – just plant them in a window box in a room of your choice, and you’re all set. If you have a soft corner for tulips, try arranging them into interesting bouquets; they are easy to hold, and most definitely are a treat to sore eyes. 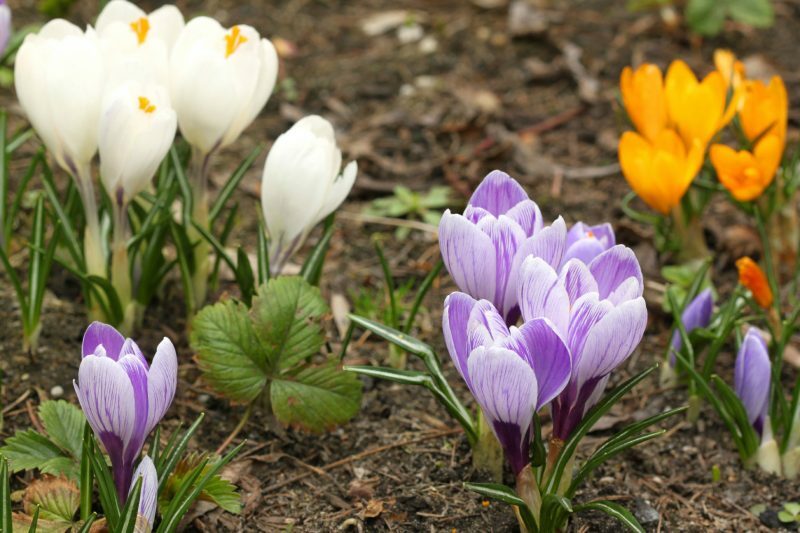 Crocuses have amazingly colorful blooms that add instant warmth to your indoors, and of course, your outdoors as well. They are available in yellow, purple, and pink, and more hybrid varieties, so you could mix and match them to suit the occasion. Pastel-colored Hydrangeas look just stupendous in vases, especially, if you bunch them up just right. They are delicate and feminine, and add a soft touch to the ambience. Take good care of them, and they’ll last longer. Potting bulbs of your springtime lovelies can bring fragrance to any corner of your house. Place them in a prominent section of your home, like the kitchen, seating area, and windows, the patio, deck and inhale the sweet perfume. You could also get creative with your potted plants to give it a dazzling look and feel – mix different colors in the same pot, and you’ll be pleasantly surprised with the results.